Crown Prince Mohammed bin Nayef, Saudi Arabia’s deputy premier and interior minister, has been presented with a CIA award for his work fighting terrorism, prompting raised eyebrows on social media. CIA Director Mike Pompeo gifted the prince with the George Tenet award in Riyadh on Friday. Named for the former Director of Central Intelligence under Bill Clinton and George W Bush, the George Tenet award recognized the Saudi royal’s intelligence work against terrorism and his contributions to peace and security. Tenet served as Director of Central Intelligence from July 1997 to July 2004. In 2015, a CIA report was declassified, slamming Tenet in particular for failing to thwart Osama bin Laden despite years of warnings and threats from al Qaeda, which ultimately resulted in the 9/11 attacks. The prince also said the award recognized the Kingdom’s anti-terrorism efforts under King Salman bin Abdulaziz Al Saud, and commended Saudis working in security agencies as well as the Saudi people for their work to combat terrorism. 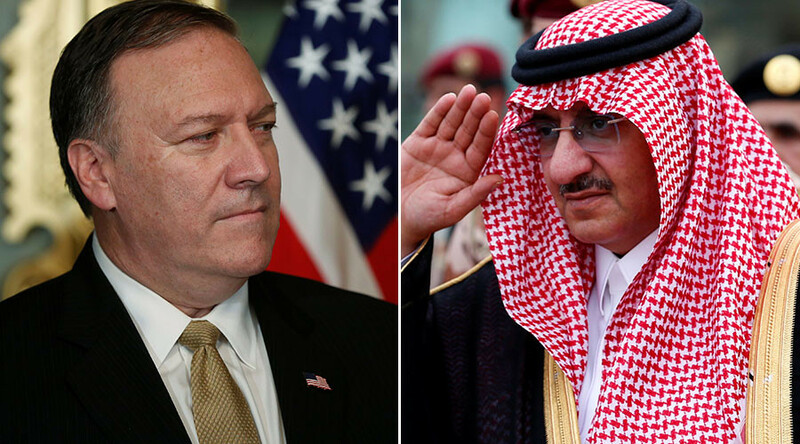 Bin Nayef highlighted the fact that the Kingdom had successfully prevented several terror plots, including ones against friendly countries, and described the US-Saudi relationship as “strong and historic,” saying nothing would come between them or damage their ties. The gesture has been viewed as ironic on social media, given the controversy around Saudi Arabia. “Worst joke ever,” a social media user tweeted. “Giving a Saudi prince a medal for combating terrorism is the equivalent of giving McDonald's a medal for combating obesity,” another said. Of the 19 suspected 9/11 hijackers, 15 of them were from Saudi Arabia, according to the CIA. In 2015, one of the alleged 9/11 hijackers, Zacarias Moussaoui, claimed several members of the Saudi royal family had been listed as al Qaeda donors in the database he worked on under orders of Osama bin Laden, CNN reports. Families of the victims of 9/11 have brought a lawsuit against the Kingdom. The “Justice Against Sponsors of Terrorism Act” was passed in September, and allows US citizens to sue foreign countries for terrorism. “Saudi Arabia remains a critical financial support base for al-Qa'ida, the Taliban, LeT, and other terrorist groups,” the cable continues. Accepting the Tenet award, bin Nayef pointed to the dangers the Kingdom faces. “We are surrounded by areas of conflict, and we were the first affected by terrorism from various sources, but we are equipped to combat terror in any place and under any circumstances,” he said.